Collection of 'Cool Folding Bikes and Creative Folding Bike Designs' from all over the world. 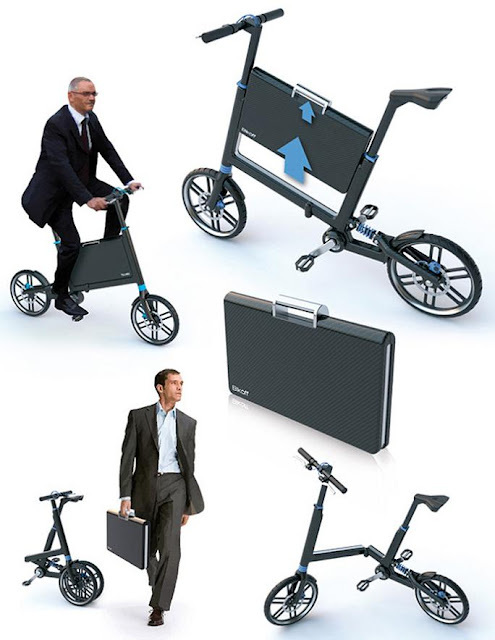 Bikoff: Designed by Marcos Madia, Bikoff is a folding bike with a built-in briefcase. Backpack Bicycle: The Backpack Bicycle weighs about 5.5 kg and it can be folded up into a backpack measuring just 60cm in length. Donut Bike: The Donut bike folds into a super-compact circle and you can fold it and take it anywhere you want. VeloMini : The VeloMini Folding Electric Bike weighs just 31lbs, can take a rider of up to 210 lbs, and transport a person from eight to ten miles at speeds of up to 12 mph or 19 km/h. 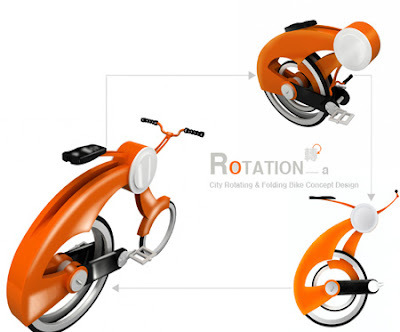 When not in use it folds down to a compact form 18-inches tall. 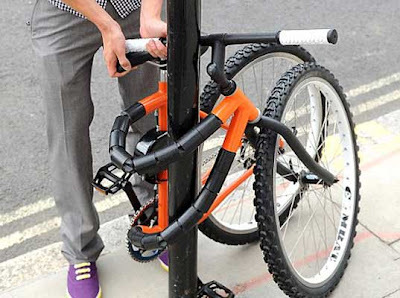 Bendable Bike: Designed by Kevin Scott, you can tie this bendable bike to any post. Compactable Urban Bicycle: Designed by Victor Aleman, it consists of Wheel folding system and Bike Structure System. Ville: "Ville" is an urban folding bicycle designed by Hyuk-Jae Chang. 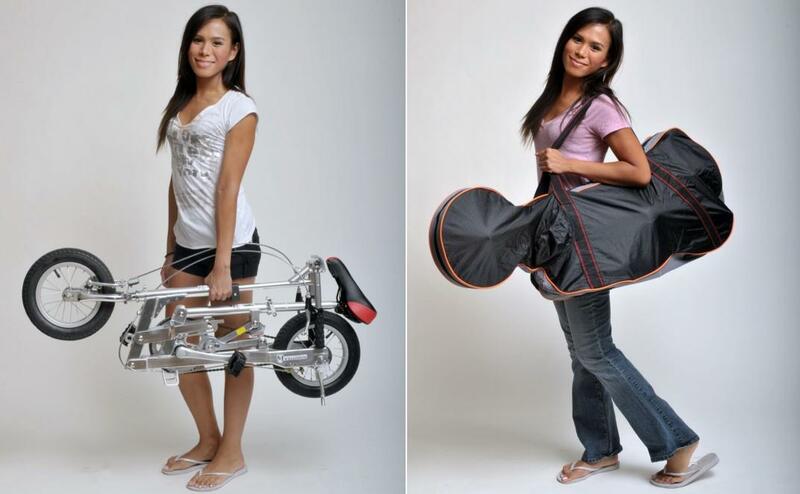 It comes with two storage baskets and folds up from the middle and doubles up as a cart. 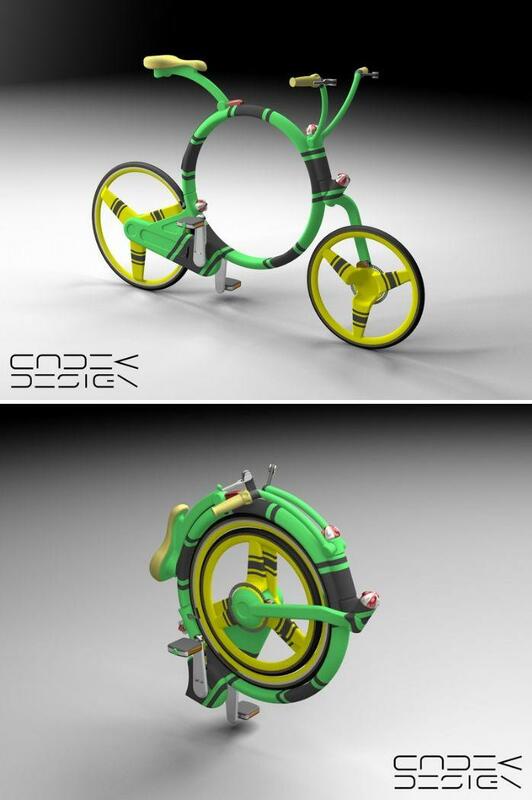 YikeBike: The Yikebike is made of carbon fiber and weighs 11.5 kg, has a top speed of 25km/h (15 mph) with a range of 10 km on a single recharge. Union Folding Cycle: This folding cycle is designed for easy transportation in buses and trains. 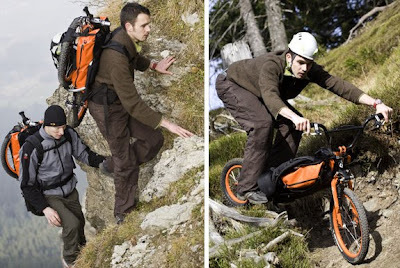 IziBi Folding Bike: IziBi Folding Bike by Renato Gschwend is a compact, stylish and portable mountain bicycle designed with single rear and front suspension. 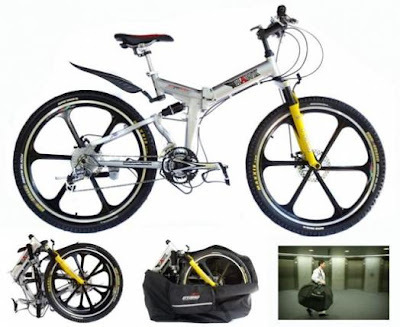 Dual Suspension Folding Bike: Onyerbike, an innovative bicycle company came up with four-bike ranges of foldable, full-size, dual-suspension bikes. 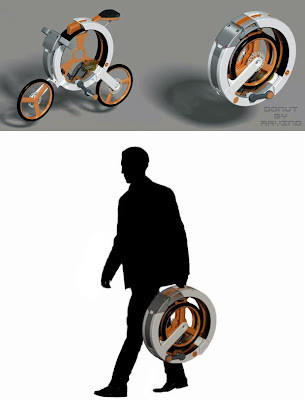 Rotation City Bike: This folding bike concept design seems to be a combination of unicycle and bicycle. 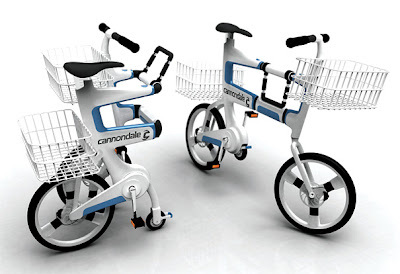 A-Bike: This folding bicycle weighs 5.5 kg; folds and unfolds in only 10 seconds. 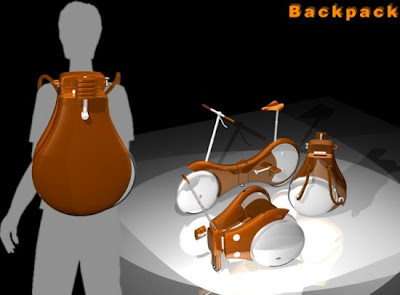 Backpack Bike: This bike transforms into a backpack. 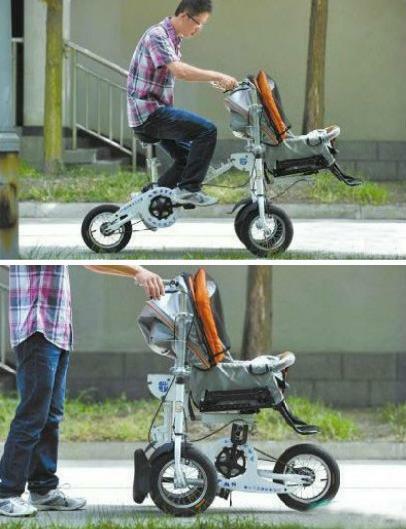 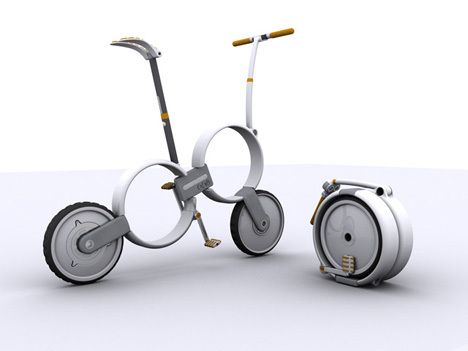 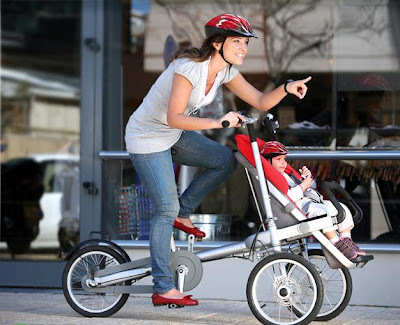 Stroller Design 9-15: Designed by Shengjie Yu, the bike transforms into a stroller. Electric Bike Concept: Industrial designer Yuji Fujimura's electric bike concept is an alternative to regular cars and motorcycles. 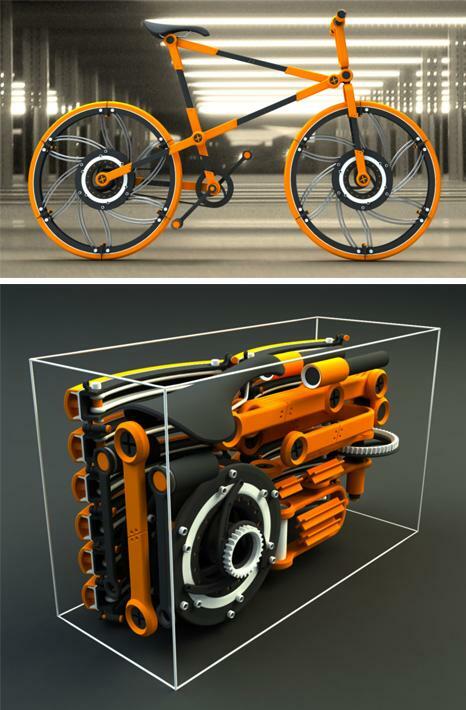 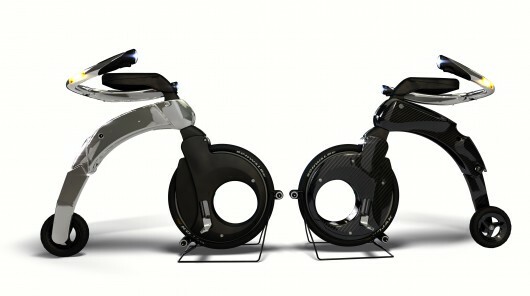 All the extended components can be folded down, resulting into a space efficient bike. 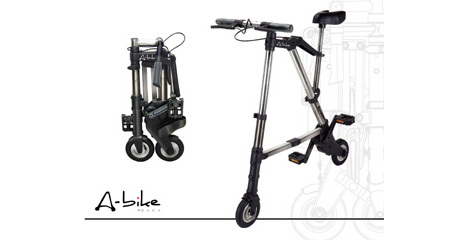 Apart from these, the bike enables you to recharge your notebooks, smartphone and other portable gadgets. 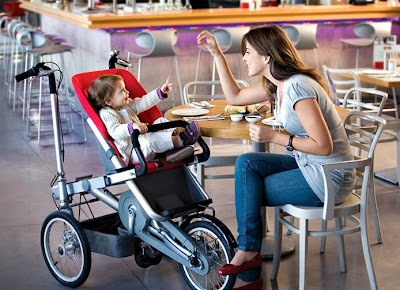 A built-in screen at the steering provides direct access to the your notebook to gain necessary information at any moment. 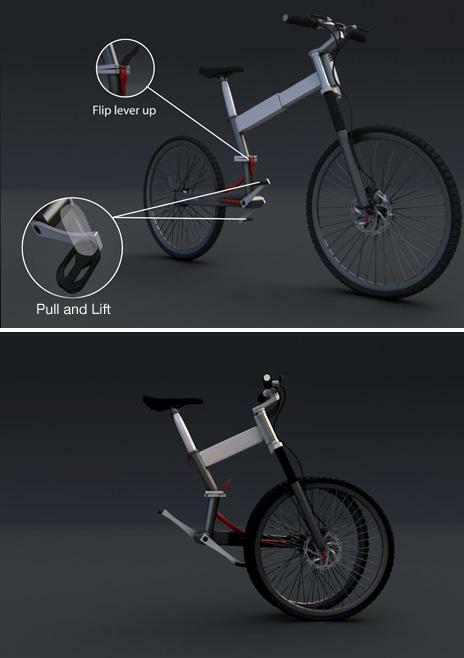 'One' - Folding Bicycle: Designed by Owen, 'One' is a comfortable stylish bicycle when opened; and when folded, 'One' turns into a smooth, light and compact case. 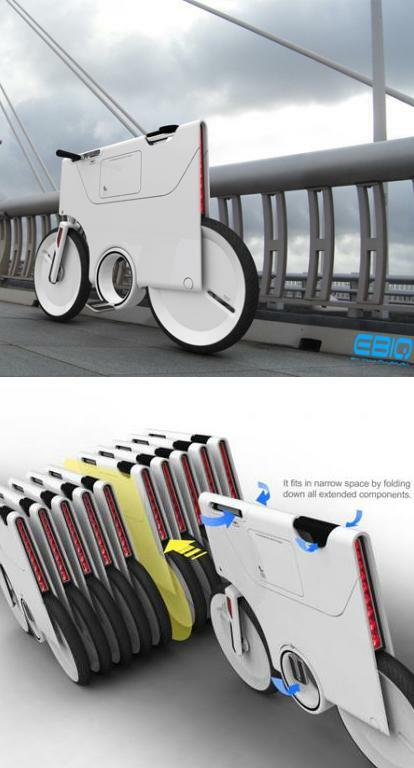 Thus providing a solution to the problems involved with urban transport.